The state broadcaster continues pushing the propaganda narrative of the Trudeau government, and truth is left far behind. 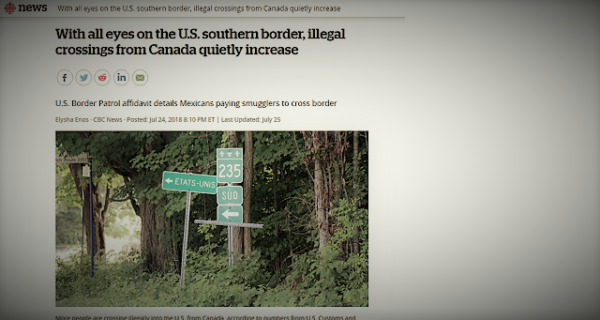 A recent article on CBC News is titled “With all eyes on the U.S. southern border, illegal crossings from Canada quietly increase. “Mexicans wanting to illegally enter the U.S. are flying over it first, landing in Canada and then walking south across the northern border — sometimes with the help of human smugglers, according to the RCMP and U.S. Border Patrol (USBP). And the numbers of people doing that are going up, judging by how many people were apprehended for crossing the Canada-U.S. border illegally this year, compared to previous years. There’s nothing wrong with any of what is written. In fact, it’s perfectly factual. Why is it that far too many in Canada fail to stand up to this sort of thing? I suppose a big part of the reason is the very important fact that MOST in Media are Liberal Activist by nature. Why are so many in Media on side with PM Justin and his desire to change Canada and Canadian People? It was not all that long ago I felt the CBC was “Evil but Necessary”, now I believe the CBC is just “Evil” !! My Parents Famiies are both Immigrants to Canada but Legal Immigrants. If I was American I would more than likely be a DACA Guy providing People had Paid Taxes, Contributed by Working, Serving in the Military, had NO Felony Convictions and the rest. Offer those same people a TEN YEAR Path to Citizenship and providing they are not convicted of a Felony they can apply for and acquire Canadian Citizenship. That would be a very simple, honest, and fair approach to the problem. In the meantime the U.S. needs to build a Wall and they need to Deport ALL Criminal Felons. Very Simple, the U.S. and Canada needs to stop Illegal Migration. They ARE NOT Refugees. Without Control of Migration, without Defined Borders, and without the ability to Defend those Borders one has NO Country. Simply ask any Citizen of the EU about that Starling and Gut Wrenching Fact! A Country cannot and should not allow Migration by any Group of any Ethnic Background to settle in that Country when they believe their Religion Supersedes the “Rule of Law” in that Country. Time for the CBC to go to where Ontario Premier Kathleen Wynne went and where PM Justin will soon go, only uh, fourteen uh, months uh, to uh, wait. Banning handguns will be the next thing they push. The reality is that Canadians like being told what to do by the government in fact they seem to love it. When there’s a problem Canadians are quick to turn to the government to “fix it” and as long as that’s the attitude of the majority Canadians nothing will change. Pendulums swing. Causing the clock to tick tock. Trump is the tock Obama the tick. Ford the tock wynne the tick. Justin the tick Scheer the tock. At least CNN is not funded by tax payers. Time for the CBC to disappear sort of like 47 city councilors becoming 25. Now this is a trend that we should all applaud. Ford might just start the snowball effect. Imagine if all three levels of government public “servants” were trimmed by about 30%.